With the recent fire of North Eutaw Street’s Gomprecht and Benesch Building happening just weeks ahead of the grand opening of the renovated Hochschild Kohn building (a mere three blocks away), many in Baltimore are asking if plans to reclaim large portions of the city can overcome the effects of neglect, tomfoolery, foul play and Father Time. But Johns Hopkins, the Executive Director of Baltimore Heritage – a nonprofit historic-preservation organization based in the Mt Vernon neighborhood of Baltimore, Maryland – remains hopeful. He believes a shift in strategy by the former mayor is making all the difference in Market Center. 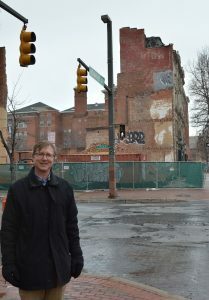 Shortly after the mid-January fire at the Gomprecht and Benesch Building, the Baltimore Post-Examiner spent a blustery afternoon with Hopkins, walking the streets of Market Center – the westside area which encompasses the legendary Howard Street shopping district. “I’ve been with Baltimore Heritage for 14 years, and at least ten years prior to that, the organization began to push for a preservation based strategy for redevelopment. I think, here in Baltimore, we’ve learned that you can get better results by working with specific buildings and individual owners, rather than using the super-block approach, where you just knock everything down and rebuild. It’s like the baseball analogy, where you hit a lot of singles to score, instead of just swinging for the fences,” said Hopkins. 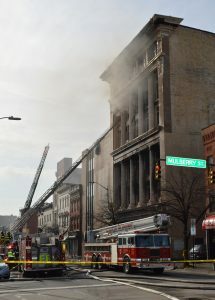 The devastating fire notwithstanding, Hopkins said he was excited to see the progress at West Franklin Street and Park Avenue. The former Hochschild Kohn department store at 520 Park Avenue is a 171-unit market rate apartment building with ground floor retail. Around the corner, at 300 Cathedral Street is a 59-unit adaptive reuse apartment building, which was once known as Odd Fellows Hall. Hopkins noted that the rehabilitated Hochschild Kohn building is almost fully leased out and marveled at how quickly the new apartment building next to the Hochschild Kohn building is going up. “Further south on Park Avenue, there’s a proposal to reclaim an entire block of the old Chinatown area, but again, they’re keeping the historic structures intact, because they are great old buildings. There are a number of projects in the planning stages, but there are 6-7 that are well on their way, so it’s beyond talk. They’re actually making it happen. 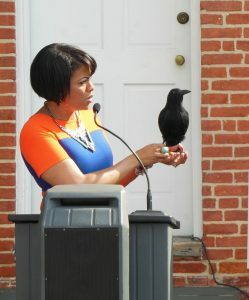 “I think to her credit, former Mayor Stephanie Rawlings-Blake brought in people who took a hard look at what needed to be done around here. We had tried the big top-down approach and didn’t get anything out of it. “One of the things the consultants suggested was that, if this area was to be successful, the Mayor and the University of Maryland would have to get together to lead the charge. The Mayor did that, so for the last 3 years of her administration, they refined their approach to redevelopment, and now we’re seeing the fruits of that vision. Hopkins told us there is map available from the Baltimore Development Corporation (BDC), which shows what is still being planned and what is now complete. 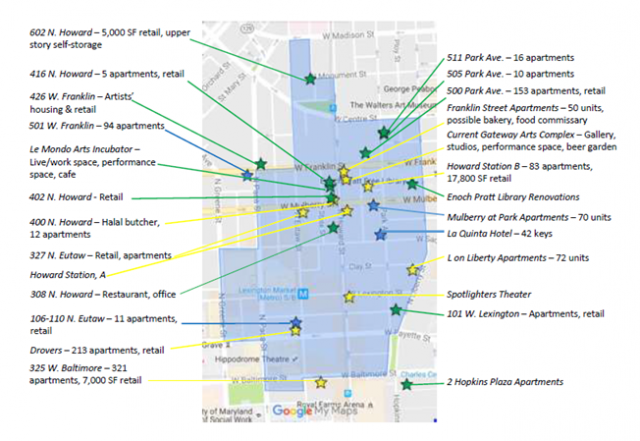 “What is driving a lot of this investment is the building at West Franklin and Park, and some of the other successful apartment complexes in the area. You see how it all ties together. The Maryland Historical Society is also expanding its reach, with things happening at old Greyhound Bus terminal and the Enoch Pratt House around the corner. I understand they have opened the house to proposals for how to utilize that historic space. It’s a great space which has been under used for quite some time. “And then you have the Mayfair Theatre. With so much going on – and so much yet to be done – we asked Hopkins if there are any specific buildings he has his eye on? “Well, we’ve always had our eye on the Mayfair. That’s been the case for almost 30 years. But prior to that, Baltimore Heritage was instrumental in getting Market Center designated as one of the most endangered historic places in the country, by the National Trust for Historic Preservation (NTHP ). Like hitting a lot of singles in baseball?